The Opening of Holocaust Monument at the Soshne Forest Killing Site. 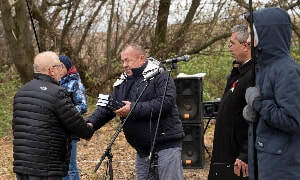 The ceremony of the opening Soshne Holocaust Monument was conducted on October 25, 2018 on the site of mass killing of Jews in Soshne forest near Izyaslav, Khmelnytskyi Oblast. 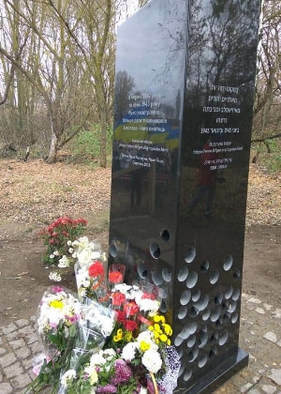 This monument is the first in a series of monuments funded by the Tsal Kaplun Foundation (TKF) to honor the Holocaust victims and to ensure that the horrors of the Holocaust are not forgotten. Over 2,000 Jews from Izyaslav and the surrounding areas were killed at this site. The opening was organized by Tsal Kaplun Foundation based in New York, USA and State Administration of Izyaslav Rayon of Khmelnytskyi Oblast. 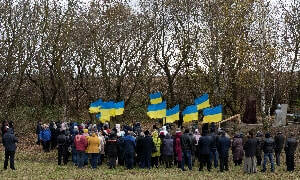 Over 200 people from Izyaslav, Khmelnytskyi, Slavuta, Shepetivka, Rovno, Vinnitsa, Belaya Tserkov and Kiyv were in attendance for the opening ceremony. Joseph Menaker, Co-founder of TKF, opened the ceremony. The Chairman of Izyaslav Rayon Administration Boris Yatskov, the Chairman of Izyaslav Rayon Rada Sergey Schlegel, Mayor of Izyaslav Valentina Korneychuk, sculptor Gleb Panteleev, Manager of charity fund “Хесет-Бешт» Galina Skripnik, Representative of US Embassy in Ukraine Steven Western presented emotional speeches about Holocaust tragic events. The staff of local museum and library, teachers and students of local school took part in the ceremony. All speakers emphasized the necessity of not only to remember tragic events of the past but to resist antisemitism and to educate young generation about Holocaust history. Rabbi Yoseph Teitelbaum of Khmelnytskyi prayed for the victims. The two meta sequoias were planted by RememberUs.org, a US-based non-for-profit charity organization that is very active in Ukraine. RememberUs.org works to honor and to commemorate those who perished in the Shoah and to educate future generations about the devastating and everlasting consequence of genocide. The event was covered by Kiyv TV 1st channel, Jewish.org.ua online publication and local press. TKF is very thankful to Victor Kucheruk, Director of Communication of Izyaslav Rayon Administration, and Evgeny Yatsimon, leader of Jewish community of Izyaslav, for their hard work for setting up this memorial event. 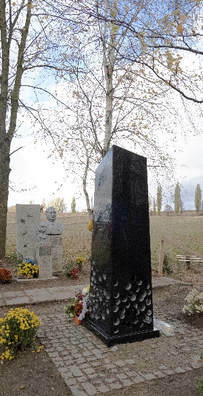 The monument for Soshne killing site was designed by the prominent Latvian sculptor Gleb Panteleev. Gleb Panteleev describes his approach to the monument design as follows: “The sculpture is an attempt to express the conflict of chaos and harmony, to understand that harmony is effort and work. And chaos is the surrender to the Beast. The lower, roughly perforated part of the obelisk is in the zone of chaos. The upper symbolizes harmony and the victory of the mind”. The monument was manufactured by Antik-Trade Company in Korostishev, Zhitomir Oblast. TKF based in New York, USA was established to commemorate the life and names of the Holocaust victims. The pain and suffering of millions of Jewish families should be acknowledged by future generations. Photo album "Soshne Kiling Site"
Photo album "Opening of Soshne Holocaust Monument"